Central Province Chief Minister Sarath Ekanayake criticised the Ceylon Electricity Board (CEB) for being a “stumbling block” in resolving the severe traffic congestion that has become the bane of Kandy town. He made the observation while addressing a conference called to explore ways to ease traffic flow in Kandy. Mr. Ekanayake, who is also the Minister of Local Government whose office administers the Kandy Municipality as a local authority, claimed that the CEB had not taken action to reposition electricity supply posts that were obstructing the smooth flow of traffic. Meanwhile, the Kandy Municipal Council, together with the city’s police, have initiated a new traffic plan on a trial basis. Senior Deputy Inspector General of Police (DIG) Gamini Dissanayake told the conference that if traffic is reduced in the centre of Kandy town the roads leading to and out of the town could become free of severe traffic congestion. He said congestion normally experienced on Sirimavo Bandaranaike Mawatha (formerly Peradeniya Road) and Gopallawa Mawatha had disappeared after the traffic plan trial began on Tuesday. Senior DIG Dissanayake pointed out in a video presentation, that the area in front of the Post Office which belongs to the Department of Railways should be cleared along with a row of shops on Boy Scouts Mawatha, and alternative space given to those who used those areas. He also suggested that electricity supply line posts that are an obstacle to the free flow of traffic should be removed. On the whole, he said that the trial run of the new plan had been a success and there had been no protests. He further suggested that Sirimavo Bandaranaike Mawatha and Gopallwaa Mawatha should be adjusted for one-way traffic for three hours in the morning, before the opening of commercial establishments and three hours in the evening. He added three-wheeler parking spaces should receive attention. Chief Minister Ekanayake said moving the electrical posts hindering the progress of traffic was the duty of the CEB and no charges should be levied from local authorities. 1. All traffic commencing from Goods Shed (Central) Bus Stand and proceeding towards Peradeniya should turn off at the junction of the Kandy Market and proceed along Keppetipola Mawatha up to the roundabout at Bogamabara and then along Gopallawa Mawatha. 2. Traffic from the Goods Shed Bus Stand will not be allowed to turn off at the railway station roundabout and travel on Gopallawa Mawatha. 3. All vehicles travelling from the Clock Tower Bus Stand en route to Colombo and Peradeniya should turn off from behind the market and proceed along Keppetipola Mawatha to the Boy Scouts Roundabout and proceed to Gopallawa Mawatha. 4. 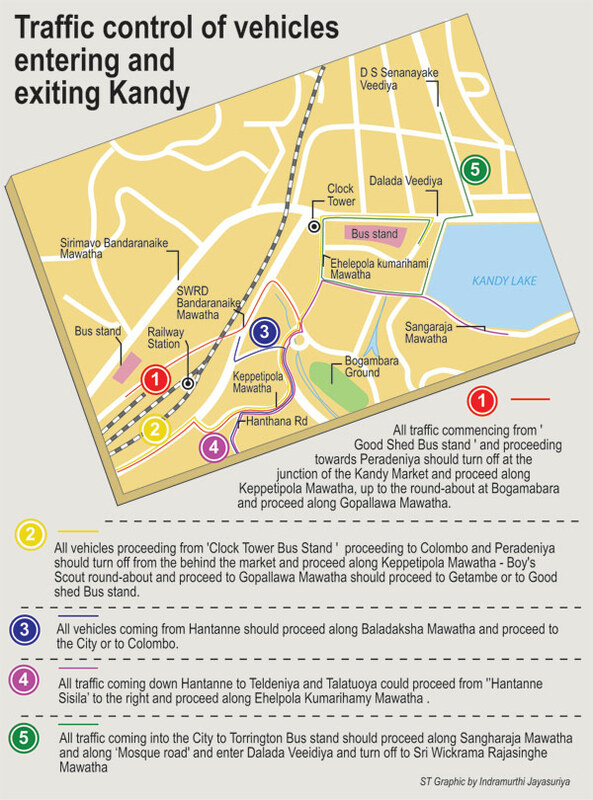 All vehicles coming from Hantana should take Baladaksha Mawatha and proceed to Kandy City or to Colombo. 5. All traffic coming down Hantana to Teldeniya and Talatu Oya should travel from Hantana Sisila to the right and proceed along Ehelepola Kumarihamy Mawatha. 6. All traffic coming into Kandy City to the Torrington Bus Stand should proceed along Sangharaja Mawatha and along Mosque Road and enter Dalada Veeidiya and turn off to Sri Wickrama Rajasinghe Mawatha. Meanwhile on Friday, police were able to avert a major clash between two groups over the opening of the section of the Kandy-Mahiyangana Road that runs opposite the Maha Maluwa of the Sri Dalada Maligawa.